Investing in the stock market is something that many people do. In the UK alone there are 5,137,960 people who directly invest in shares and many more than this do so through ISAs, pension and insurance companies. In an evaluation of world share ownership, where people held shares directly, the total number of people who own shares is 500,000,000 (half a billion). So what is the appeal of investing in the stock market. Stock market returns have often been better than other asset types. Each year a study by Barclays Investment Management assess the return from shares, property, bonds and banks. The predominate outcome is that shares outperform the other investments in the majority of cases. It is important to highlight that this is in the majority of cases. In some cases the returns are beaten by other asset classes. On some occasions, such as after the collapse of Lehman Brothers Bank and the start of the financial crisis, you can end up getting less than you have invested. Investing in stockmarkets is NOT risk free. Which brings us to “How to invest in the stock market with a 99.4% chance of success.” In an excellent article and research by Woodford Funds, a fund management company, the length of time that you hold your investments can have a significant impact upon your chance of successful investing. 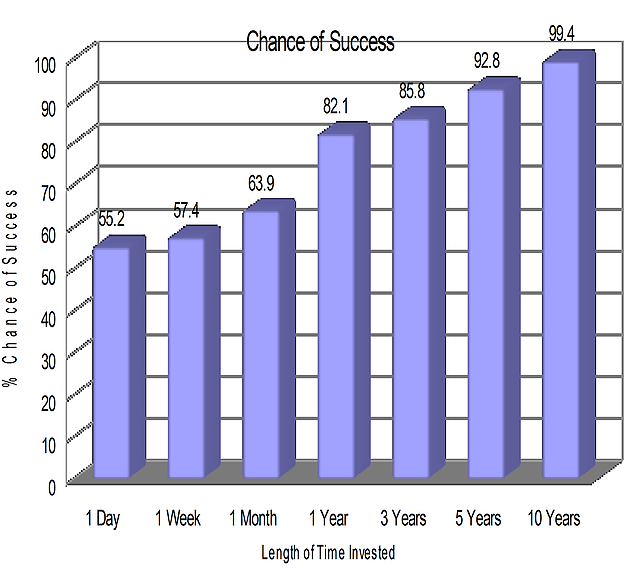 In short, if you invest for a short period your chance of success is smaller than if you invest for the longer term. Indeed, the research shows that if you held your investment for 10 years you have a 99.4% chance of a successful investment. Investing in the stock market is something that many people do. In the UK alone there are 5,137,960 people1 who directly invest in shares and many more than this do so through ISAs, pension and insurance companies. In an evaluation of world share ownership2, where people held shares directly, the total number of people who own shares is 500,000,000 (half a billion). It is important to highlight that this is in the majority of cases. In some cases the returns are beaten by other asset classes. On some occasions, such as after the collapse of Lehman Brothers Bank and the start of the crisis, you can end up getting less than less than you have invested. Investing in stockmarkets is NOT risk free. I would like to highlight that these figures are for the UK stockmarket as a whole and that past performance is not a guarantee of future return. A really good manager like Neil Woodford can often improve your chances of success. I have had a professional relationship with his firm for many years, starting when he came to make a personal presentation to a special group of my clients in 1988. One of his many successes was not to have investments in technology and internet comàmies in March 2000 thereby avoiding the worst of the crash. Indeed, some of the shares he did hold became the shares everybody wanted after the crash. His expertise is well documented and his result serves as an example of how a good manager can increase your chance of success. So a good manager and a long term approach can increase your chance of success. However, as specialist financial planners in Spain we can assist you with putting this approach to use to meet your financial goals and help you minimise the tax consequences in Spain.